﻿ Mancini: "Balotelli can become as good as Messi and Ronaldo"
24.10.2011 » Mancini: "Balotelli can become as good as Messi and Ronaldo"
Manchester City surprised the World this last weekend, as they visited visited Old Trafford and demolished a weak Manchester United side. One of the main figures of the match, apart from David Silva, was the Italian Mario Balotelli, who scored 2 goals, including the opener. Mancini believes that Balotelli can reach the same level as Lionel Messi and Cristiano Ronaldo, if he focus exclusivelly on football. In what was most likely one of the biggest surprises of the still on-going season, the 1-6 victory from Manchester City in Old Trafford, against the local Manchester United, is still sending its shock waves all around the World. The Citizens coach, Roberto Mancini, has spoken out against the criticism over his player, Mario Balotelli, and claimed that his countryman can very well reach the same level as Barcelona's Messi and Real Madrid's Cristiano Ronaldo. Balotelli has been involved in multiple incidents on his still short career. Earlier this week, he added another one to the roll, as he set his own house on fire, after deciding to shoot fireworks from his bathroom window, in what appeared to have been an entertainment event he had with some friends, to fight against boredom. Obviously, the English media were all over that unusual incident, but Balotelli doesn't seem to like being the center of attentions, and he proved it by showing a funny message on his shirt, after scoring the opener goal against Manchester United. 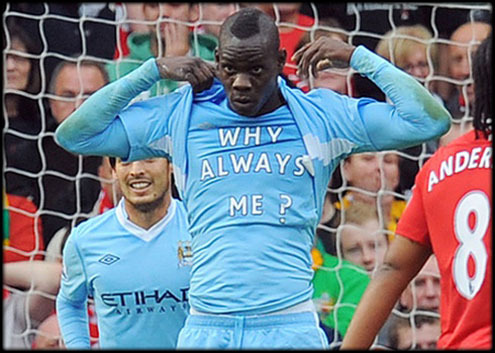 Balotelli wrote: "Why always me? ", probably still confused and clueless why he keeps being targeted by the media. Should we give him a hint? When looking exclusively to Mario Balotelli's potential as a football player, Roberto Mancini held him in very high regard. Mancini: "If we look at Mario Balotelli only as a football player, we can rank him as one of the best 5 players in the World." When asked to comment on the fireworks incidents which Balotelli was involved at, early this week, the Italian coach skirted the issue: "I don't know what happened, except that he now lives in a hotel. 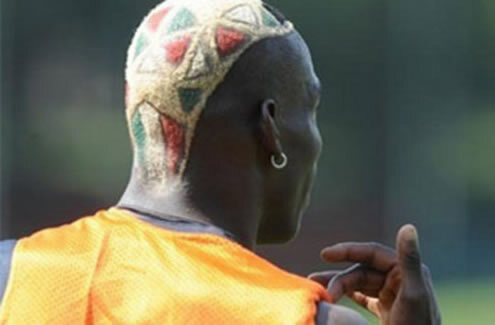 Let's all hope for his own sake and for football in general, that Balotelli can change his mind when he's off the pitch. When he manages to do that, he can be one of the best players in the World, at the same level as Cristiano Ronaldo or Lionel Messi." Despite showing his concerns about Mario Balotelli's unpredictability, Mancini tried to find justifications for a few awkwards incidents, on which the Italian player keeps being linked to. Similarly to what happened to Cristiano Ronaldo on his early days in Manchester United, Mancini believes that his young age remains being an important factor: "The problem has to do with him being very young, which occasionaly lead him to make some mistakes. He is Mario, a crazy boy, but I love him because I know he's a good guy." Real Madrid will face Villarreal this Wednesday, for La Liga You can watch Real Madrid vs Villarreal live stream, in our Football Live Streams section. The countdown clock timer, displaying the time left for the next Ronaldo game, is shown on the top right corner of all pages. Besides that game, you can also follow the Carling Cup this Tuesday, by watching Aldershot vs Manchester United live. In a La Liga fixture, you may watch Granada vs Barcelona free. All streamings are provided from our "Live" section.